As we end our first full fiscal year at Emma’s Torch, I am in awe of all that we’ve accomplished. We served hundreds of avocado toasts at our pop-up Classroom Cafe in Red Hook, Brooklyn; won the Princeton Entrepreneurship Network’s start-up competition against a slew of for-profit ventures; were featured multiple times in the New York Times; and prepared to open a terrific new restaurant in 2018 as our home for the years ahead. Most importantly, we helped eight refugees from around the world who completed our culinary training, and welcomed them to America as valued contributors. This work would not have been possible without the dedication of our board, under the leadership of Francesca Furchtgott, and the many team members working day in and day out to ensure that what began as a dream could become a reality. Someone recently asked me what I do at Emma’s Torch, and I laughed: on any given day, I’ve been part dishwasher, CEO, plumber, chef, fundraiser, and career counselor, to name only a few. The best way that I can describe my role is resident spider: I weave a diverse web of students, chefs, industry professionals, and donors who come together to make Emma’s Torch and its mission of refugee empowerment a reality. That network of advisors, mentors, and volunteers circles the globe, including people ages 12 to 85, and has been fundamental to our success and growth thus far. I love my role as Spider-in-Chief, and am continually inspired by each element of my web. 2017 allowed us the opportunity to plant the seed, that we plan to grow sustainably in 2018 and beyond. As we proudly look back at all that 2017 has brought our organization, I am deeply thankful for your support in making this possible. With exciting growth in store for 2018, I encourage you to come along for the next stage of our journey. Harness the power of the culinary industry to help refugees build new lives in their new communities. Empower refugees through culinary training. 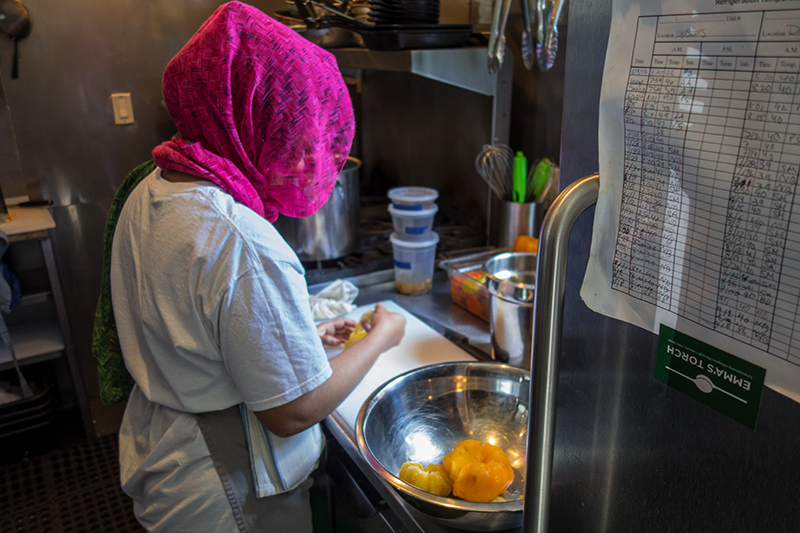 We provide refugees and survivors of human trafficking with culinary training, ESL classes and interview preparation. We set our students up for successful employment in an industry in which their cultural heritage and cuisine can be celebrated. What’s more, we provide a community in which they can build supportive relationships. Eight students graduated from our Culinary Apprenticeship in 2017. This year, we also maintained a culinary-specific ESL Program, which graduated eight additional students. Our full 2017 apprenticeship was an eight-week, paid program, which offered its students 200 hours of culinary training and licensing. All apprentices received ESL and job interview training within their curriculum, and had the option of supplementing their coursework with the full ESL training. Each apprenticeship cohort was comprised of two students and an instructor, ensuring ample individual attention through tailored curricula. OF JOB-SEEKING STUDENTS WERE PLACED IN CULINARY JOBS IN 2017. Adwa came to the United States at 18 as an asylee from Saudi Arabia. Adwa joined Emma’s Torch in June 2017, and participated in both a culinary apprenticeship and English language training. Adwa interned at the Emma’s Torch Classroom Cafe, and her shakshuka was featured on the cafe’s summer menu. Adwa worked with us to determine long-term goals and prepare for job interviews, and ultimately received multiple prestigious job offers. After consultation with her Emma’s Torch mentors, she accepted the position as a line cook at The Dutch, where the chef offered her the chance to rotate through the organization and gain experience in multiple areas. When Kerry visited The Dutch in December, Adwa was front and center at the restaurant’s prominent Oyster bar. Our pop-up Classroom Cafe in Red Hook, Brooklyn ran from June through November 2017, with weekend-only brunch service. On average, it served 150 patrons per weekend for its six-month run. As part of their training, all Emma’s Torch students served as paid employees at the Cafe. Our students enabled us to cater large-scale events like a charitable gala dinner for 145 guests, which prepared our apprentices for the fast-paced atmosphere of the food industry. In 2017, we catered events including a Beinenu Shabbat Dinner, an event for Workmen’s Circle, and high end private dinners. Emma’s Torch also began accepting favor orders for weddings and corporate clients. Some highlights. Our press page contains a complete list of mentions. 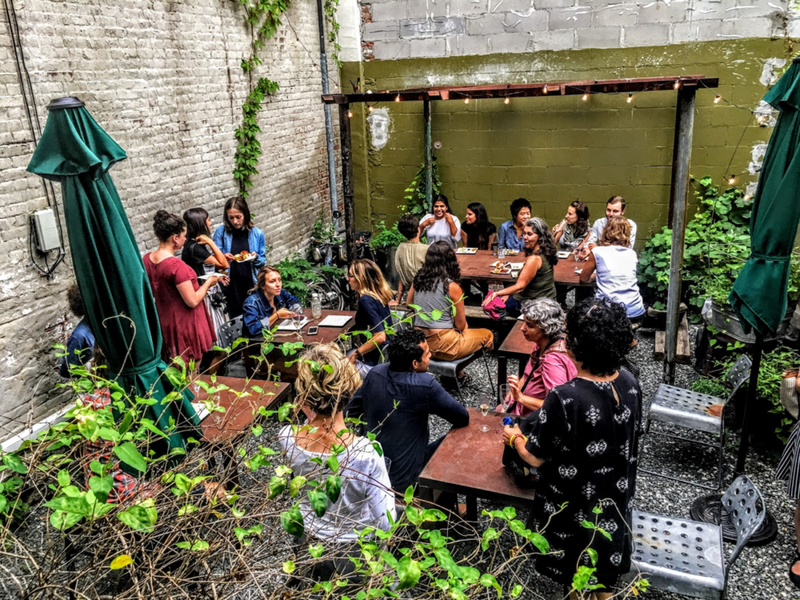 Starting in June 2017, Emma’s Torch was housed at a cafe in Red Hook, Brooklyn, where we operated a six-month pop-up residency with weekend table service. Over the course of this pilot program, we witnessed the incredible growth of our students, and began expanding our educational and culinary activities. After the success of our initial six month pilot, we decided to embrace a strategy of responsible growth, with a new and ambitious plan to significantly increase the number of students we can impact. In early 2018, we will build upon the Red Hook pop-up by opening our Classroom Cafe in Downtown Brooklyn, where we have signed a long-term lease. We look forward to scaling up our work in a sustainable way over the course of 2018. In anticipation of this scale-up, Emma’s Torch ended FY2017 with a significant surplus. This surplus was reached due to preemptive fundraising for the new cafe and its expanded Culinary Apprenticeship, and will go towards upfront costs in early 2018. We are thrilled to be opening a new restaurant and home for Emma’s Torch. It’s projected to be fully open to the public by May 2018. Our new restaurant is located in a high-density retail and residential area was chosen for its significant weekday foot traffic; and will be informed by our six-month Red Hook pop-up in 2017. The restaurant will operate on a six-day weekly schedule in 2018, a significant increase from the pop-up’s weekend-only model. Its 1,500-square-foot footprint also includes a larger kitchen, allowing us to take on additional revenue from larger catering clients and product/gift orders. This year, we trained eight refugees from all over the world through our emerging culinary training program at 24 hours per week. Additionally, we hosted weekend brunch at our temporary Red Hook location. In the new year, we plan to drastically increase the scale of our work, hosting up to 40 refugees through what will soon be an eight-week training program totaling 400 hours in length. Our new, permanent space in Brooklyn will host brunch on weekends, as well as full dinner service six nights a week. We are delighted to have Kimberly Lerner, an experienced restaurant manager, join us as our General Manager. Our kitchen will be led by the exceptional Chef Alex Harris, of Blue Smoke and Cafeteria. We are excited about this incredible opportunity to sustainably expand our reach and increase our impact. We end the fiscal year with a significant surplus, thanks to preemptive fundraising for our planned scale-up. We have also secured $25,000 in in-kind goods, services, and inventory for FY2018, including $6,000 of crowd-sourced kitchen equipment given through our Amazon Gift Registry for #GivingTuesday in November 2017. As of December 2017, we have confirmed several FY18 gifts from the foundations shown below, which will apply directly towards the culinary apprenticeship.